Sometimes it’s just not possible to go out and enjoy the fresh air, and to tire out highly energetic children. But there’s lots of reasons we may find ourself stuck inside, not able to get out and play. The weather is regularly a big factor - it can turn miserable in a heartbeat, and scupper plans. You will also find yourself on lockdown when your little one just isn’t feeling well. And if your child is poorly and under 3, it gets really hard to explain why they have to stay inside and rest. Their attention span won’t last long enough to read them a story - they’ll likely need an activity that’ll keep them busy over a longer period of time. Ideally one that is relaxing-yet-fun. So we have gathered a few recommendations from our lovely toucanBox community on Facebook to find out what fun things they do at home with their little ones. Depending on their age and energy levels you can easily adjust the the activities to suit your child’s needs. 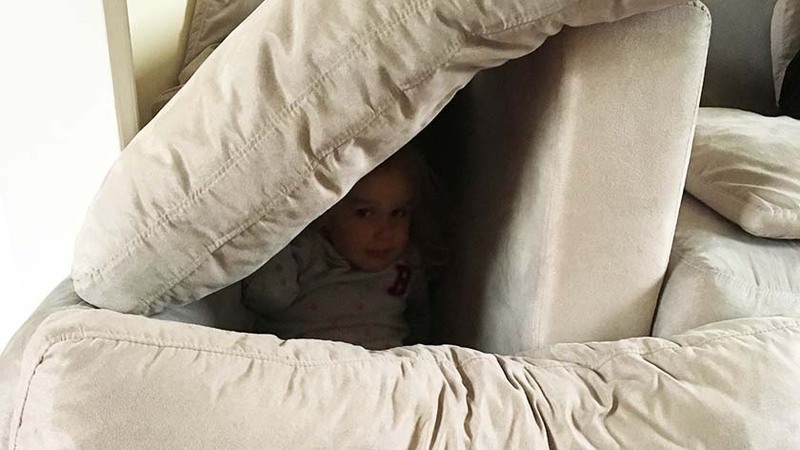 There is probably not a single child between 1 and 10 who doesn’t like to build and play in dens or caves. At toucanBox HQ the great majority of us claim to be grown-ups, and we’d all love to while away an afternoon building a massive pillow fort. Children’s imaginations go wild with this activity. From planning the build - what will they use to make their den? Can they gather the materials themselves? - to playing inside of it, each step is an absolute pleasure. Hopefully they’ll be inspired to come up with exciting, fun-filled role play, or simply enjoy a change the scene and play with their toys ‘hidden away’ in their cave. The easiest way to create a stable den is through using a blanket or bed sheet and cover a table or some other furniture moved together. You can create quite a spacious den using four chairs arranged in a square with the blanket placed over the back rests. Add few cushions added into the cave and your kids will have a great time for sure. We really like this idea a lot. It definitely falls into the category of things to do at home with a poorly-feeling child, and requires nothing but things you already have at home. It’s up to your imagination and circumstances - how big do you want this celebration to be? 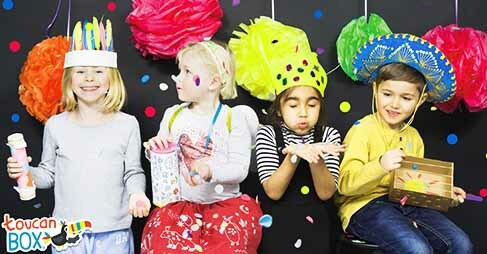 It could be anything from just a pretend tea party - maybe in your poorly child’s best to make sure they’re resting up - to a big party with music, balloons, treats and party games (think Musical Statues, Pass The Parcel and Simon Says). You can even think about inviting some of your child’d friends over to join in the fun. And party balloons will still give the kids endless fun even when the party is over. One tip from our side: start with a little smaller party as we are convinced that your children may ask for more parties like this. Be prepared to have a few ideas in reserve in case all the toys start piping up and saying their birthdays are coming up, too. Take a messy play tray or a washing up bowl. Fill it with any uncooked rice and pop in several things to help your kids to become rice-panning-experts: Spoons, bowls, cups, balls, toys - anything you can think of really. The kids love it; it’s like messy play without the mess. Rice is way easier to clean up than teeny-tiny sand grains. So everyone wins! Create a map of your home and hide small items around it. Mark each piece of hidden treasure on the map. Explain the map to your little one and offer your support for the hunting game in case they need it. If your kids are older you can use word cards describing a place where you have hidden an item. For example: “I am cold and make a ‘bing bing’ noise if left open”. The answer is the fridge, of course. Or possibly an emergency escape hatch. Kids love this combination of a quiz and hunt. It’s hard not to get in on the fun, too. Even once they’ve found all the treasure, why not get them to organise their own hunt? They can draw their own map or come up with their own cryptic questions to send you on a great search. If you can stand the risk of a few water drops here and there you can put a thick towel on the floor and place a bowl or a messy play tray filled with water on it. The kids will have endless fun while giving their toys a bath or experiencing thrillingly imaginative pirate, fishing or swimming adventures. Baywatch-like rescue-scenes actively encouraged. Stick a load of A4 sheets of paper together (or if you have a big paper roll even better!) and place it on the floor. Encourage the kids to lie down on it and outline their body with a pen. 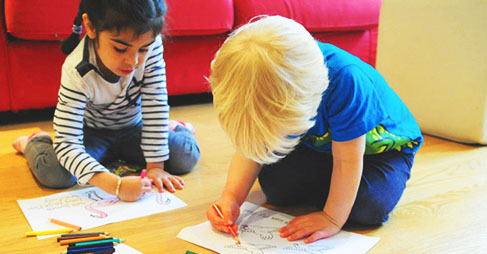 From this moment on there is no way to stop the kids getting creative: colour in, add accessories to the figures like stickers or stamps, design clothes with old material offcuts or other things you might find in the art drawer. The kids will have lots of fun with the real-size copies and you may have something really special to decorate the their bedroom wall afterwards. 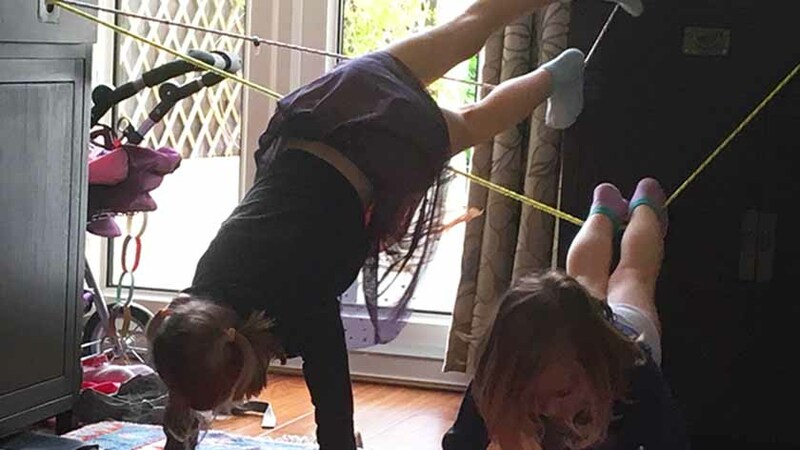 Transform your living room into a kid’s gym and create some fun and age-appropriate sports stations. You can put a trail of paper sheets on the floor which the kids have to walk over without touching anything else but the paper. Time jumping on the spot, which can be made more difficult for older kids (maybe they have to spin around while jumping). A planking station is great fun as well. If you have a soft carpet or mattress you can try some somersaults with them if they are old enough (take care that they don’t hurt their neck!). Any other kind of gymnastic exercise which is performed only with their own body weight is great. To make it more competitive you can use the stopwatch to time the duration of each exercise. But make sure to stick to age-appropriate durations. It’s about the fun and switching back and forth between the stations rather than aiming for the next world record. Even more fun is it when mummy and daddy join in the kids gym activity and afterwards you all deserve a special treat! We came up with some fun fingerprint animals that you can read all about here. Why not try to create a full zoo of handprint and finger painted animals - use different body parts to create different animals! Play mats are great fun for kids. They give them a great setting to get imaginative with their toys. But what if you created your own one? You could grab some tape and make roads all over the carpet. Think about how they will connect up, where they will lead to, and what sights you might need to add along the way. You could also use the same technique with the life size art portraits and draw your own scene on a ginormous piece of paper. Talk about what amenities the newly created community might need, and what toys are going to live there. Now we’re not presuming anyone’s age here, but if you’ve been squealing with joy at hapless contestants running through the Crystal Maze once again, you still get chills from thinking about Knightmare, or you struggle to not shout out “cuddly toy!” when you’re reminded the Generation Game is returning, we might all be singing from the same 90s-tinged-hymn sheet (probably featuring the Spice Girls). Is the reason they’re coming back a shameless cash-grab? Possibly, but we also like to think these shows had family-friendly tasks nailed down. So let’s not allow the contestants to have all the fun - create your own games! One of the suggestions that had us nostalgic was filling a tent with toy money, and blowing it around with a hairdryer - hey presto, behold the Crystal Dome! Collect a load of different items, ask your kids to remember as many as they can, and see who wins the most (“cuddly toy!”). Making 3D art is great fun. Inflate a balloon, grab some newspaper and a PVA glue/water mix, and get creating! Who doesn’t love a balloon party? There are lots of games to be played and science experiments to embark on! Make a quick dash outside to grab some rocks. Dry them off and practice painting them, or decorating them with markers. Here are some of our Halloween-inspired treats. Making an easy wintery lantern. A classic indoor game that kids love. Get your favorite clothes, dress ups or even mummy's clothes out and strike a pose! You could use toys, puppets and even film your debut episode! Build your own 20-sided 3D shape icosahedron from paper plates!